This book concerns why states engage in particular forms of transitional justice. Its overall plan is straightforward; using four cases studies to compare two competing explanations, the ‘relative power’ and ‘strategic’ hypotheses. The four case studies are post-1989 Poland, post- 2000 Serbia and Montenegro, post-1999 Croatia and post-1991 Uzbekistan and the book draws upon media analyses and a series of 220 elite interviews undertaken in those countries. Let us first consider the ‘relative power’ approach. A prominent example of this approach is the explanation of transitional amnesties by reference to a continuing threat posed by those amnestied. Grodsky sets out three variants of the relative power theory: ‘transitional’, ‘structural’ and ‘public opinion’ but generally discusses an overarching version. This generalized version predicts that as the power of ‘new elites’ increases in comparison to that of ‘old elites’, (Grodsky uses a variety of more contextually appropriate terms) the severity of transitional justice increases. We can imagine the equation as a ratio or graph. On the vertical axis we have the power of new elites as an increasing function of their capacity. (Grodsky uses power in the sense associated with Steven Lukes’ second dimension). Composing the bottom axis, Grodsky constructs a seven point spectrum of increasing severity (38). 1. Cessation and codification of human rights violations 2. Rebuke of the old system 3. Rehabilitation and compensation for victims. 4. Creation of a Truth Commission 5. Purging human rights abusers from public functions 6. Criminal prosecutions of ‘executors’ (those lower on the chain of command) 7. Criminal prosecutions of ‘commanders’ (those higher on the chain of command) Grodsky recognizes that this spectrum of justice is selective. One example of exclusion, to which he nevertheless gives a separate chapter, is lustration. But unlike the included measures, lustration does not target rights-abuses, but rather collaboration or association with the ancien regime’s institutions of repression. Since one might be associated in many different ways and for a number of different reasons, (some innocent or otherwise exculpatory) lustration is a normatively blunt and contested tool. In contrast, the measures Grodsky assesses garner more universal acceptance, as they respond to clearly wrongful acts. In preference to ‘relative power’, Grodsky offers a ‘strategic’ explanatory theory of stringency. 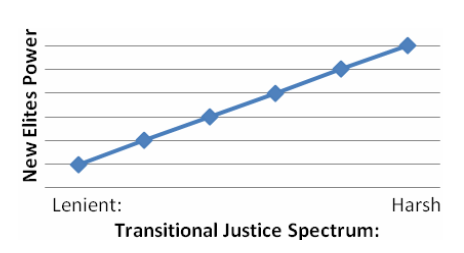 The strategic approach focuses on elite assessment of the political benefits of pursuing particular forms of justice. A key feature of this calculation is the understanding of transitional justice vis-à-vis the delivery of public goods. When transitional justice is thought non-competitive, this will facilitate greater severity. When transitional justice is seen as a distraction from the ‘real business’ of politics, then elites will pursue less stringent forms of justice. The strategic approach accommodates the dynamic and complex character of politics. Since we can expect that elites will be open to changing their minds and moreover, the expected benefits of a particular policy’s pursuit can change over time, we can expect dynamic elite support. Further complicating matters, the ‘elite’ is not a homogenous group. The justice-preference of ‘old elites’ is likely to contrast with that of ‘new elites’. Second, the institutional position of elites varies. Grodsky’s analysis splits agents into ‘primary’ and ‘secondary’ actors. Primary agents (such as a Prime Minister) have greater institutional power, but often confront relatively high levels of threat to that power (such as elections). Secondary agents tend to have less institutional power, but lower levels of threat to that power. These idealized distinctions allow Grodsky’s model to incorporate divergent reasoning among political actors. In sum, the strategic explanation of transitional justice severity contains two kinds of input data: The agent’s perception of strategic advantage/disadvantage regarding that policy and the capacity of the agent to pursue that policy. Grodsky uses the four cases to test the explanatory power of the relative power and strategic approaches. The case-study chapters have the same format. Beginning with a potted history of repression and transition, Grodsky recounts each state’s measures in terms of the seven categories of the transitional justice spectrum and concludes with a brief comment comparing the explanatory strength of the theories. It is worth nothing the problematic choice of Uzbekistan as a case study for transitional justice theory. If justice is to be transitional, then it must be part of a political transition (at least potentially) and Uzbekistan is not obviously a case of transitional politics. Nevertheless, since strategic explanations are not limited to transitional justice, the case still ‘works’ in terms of the hypothesis. Returning to the argument, Grodsky concludes relative power theory to be insufficiently puissant in all four cases. To explain this failure Grodsky argues the theory is flawed by its “focus on short-term outcomes and predominantly domestic pressures” (215). In contrast, Grodsky’s strategic theory attends to the long-term and complex game of political survival. Moreover, since there is no reason to think that strategic considerations will map the severity of transitional justice, the theory can accommodate cases where states eschew less harsh (but strategically sub-optimal) measures while pursuing harsher measures or change their tactics over time. For example, in Croatia and Serbia, pressure from non-domestic actors has resulted in some high-level offenders being (grudgingly) handed over to international courts, while few low-level executioners faced justice. In essence Grodsky offers a picture of transitional justice as public policy. Transitional justice is not beholden to unique, sui generis considerations. It is ‘politics by other means’. The analysis is in the realist or rational choice tradition familiar to political science. It would have been interesting had Grodsky critically reflected on drawbacks to this approach. Two lines of criticism are certainly relevant. The first begins with the thought that justice offers its own reasons; ideas have power. And second, simply because almost anything can be represented as being that which the political agent believed to be strategically optimal, the theory risks infallibility. In conclusion, we might ask whether the strategic theory presents a clear alternative to the relative power approach. For much of the discussion, Grodsky implies the accounts are explanatory competitors. At times this causes him to characterize relative power theory somewhat implausibly. For example, he describes it as “primarily backwards-looking” (191) and rarely emphasises those variants which include public opinion. In this he risks victory over a straw man. But in more reflective moments he argues that the strategic theory is a “complement” to relative power theory (32). And this is perhaps more accurate. As the extension is natural and has a long political science pedigree, I suspect this complement will not upset Grodsky’s readers.